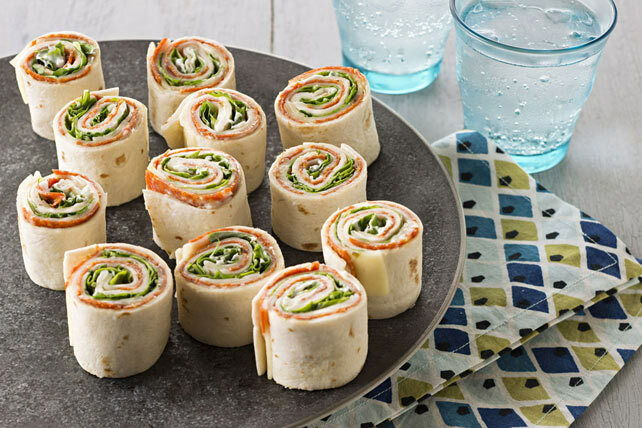 Stir up some fun at your next party by serving up some Antipasto Tortilla Appetizers. Antipasto Tortilla Appetizers are quick to make and a delight to eat. Mix mayo and garlic; spread onto tortillas. Top with remaining ingredients; roll up tightly. Wrap individually in plastic wrap. Refrigerate until ready to serve. Cut each roll-up into 6 slices. Substitute 12 slices OSCAR MAYER Hard Salami for the pepperoni. Enjoy eating appetizers at a social occasion, but be mindful of portion size so you don’t overdo it on calories. Substitute baby spinach for the arugula. These easy-to-make appetizers can be served immediately after preparing, if desired.